New Campaign Maps - Battle of the Elements!- A new Evil has taken hold in the realm, threatening to seize everything you have conquered throughout your domain! 10 new themed Campaign missions are available to any who would undertake the challenge, where Keepers must face off against the lieutenants of "The Aether". Make no mistake - this endeavor is not for the weak of heart. Only the most diabolical and fearsome Keepers will stand even the slightest chance against these enemies. The few who are victorious will earn the distinct privilege of challenging the fallen lord himself, one who possesses but a single weakness. Unlikely as it may be, any Keeper who discovers his vulnerability and defeats this champion will make their prowess known to any would-be attacker, displaying their names in gold for all to see, in addition to earning a sizable amount of Gems. 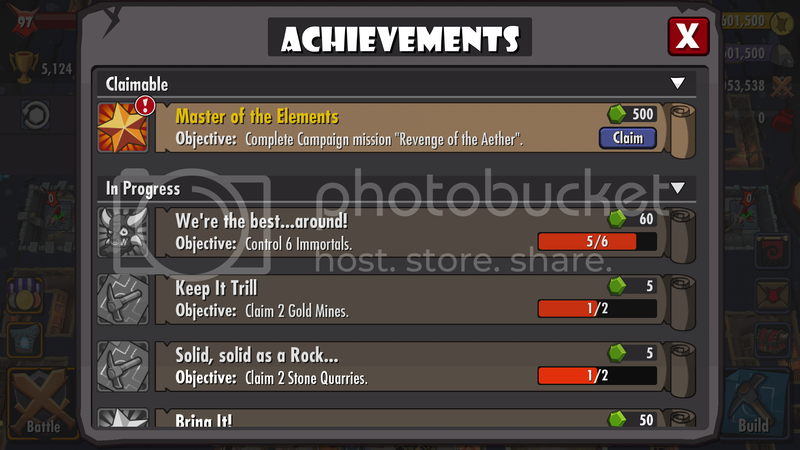 Note - Players must have completed the Campaign mission "Tomb of the Giants" in order to access the Elemental missions. A) Top 5 Put your name, date, screenshot for proof, when you completed the campaign! Black Crag wrote: This is just 5 waves of mostly flyers. First wave spawns all over the place but the rest spawn in the last destroyed room as normal. It's harder than the weekly raids. I failed once and moved a couple of AAs, then passed. If you're having trouble just redesign your dungeon to deal with AI. Plenty of posts about that elsewhere. Black Crag wrote: 1xBomb Wall (maxed) to make a shortcut to the first DL and the one below it. 3xCluck Off (maxed) to clear out the Hornies on the right side and kill as many Warlocks as possible. Trolls and Mistress to kill DLs. Horny (35) straight to the Heart. There are no bombs or zaps. just fire. 1 star win on percentage -- didn't kill the heart in time. Should be possible to kill the heart if you send a guild Mistress or Vampires with Horny. Black Crag wrote: 1 wave of flyers, then 4 waves of Hornies with some Trolls and Mistresses. Lots and lots of Hornes. It's tougher than a weekly raid. Set up a corridor of death if you need it but high DCR dungeons probably don't need to do this. I made no changes and just clucked a few times in the last wave. I'll keep going with ground attacks, someone with a better Tiny can probably find a better way to do air. Black Crag wrote: Setup: Horny, 2 Mistresses, 40 Trolls and Guild Mistress. Black Crag wrote: Starting to see a pattern here -- 1 wave of flyers then 4 waves of the same immortal in different sizes. This time it's Glarrgl. Like Horny, Glarrgl doesn't have very high hit points so this one isn't very hard. Normal defence tactics work very well. There's nothing in the first corridor so you can just send a smallish Troll team to destroy the first Hatchery. Bomb Wall from there to the next Hatchery to the left. New Troll team to destroy that, and then the third of the top Hatcheries. Bomb Wall from the last corridor into the top of the Heart -- you only need one cast because there are AA traps between the reinforced walls so you don't need to bomb that. The soft walls in the corridor are also traps so no bombs needed. Deploy Horny and Vampires in the top left room to kill the heart. If Swampy interferes you need to cluck him. I let my level 35 Horny fight him after I killed the heart and even at 80% rampage, Horny lost. Black Crag wrote: This one is a big step up in difficulty compared to the earlier defence missions. It follows the same pattern though; 1 wave of flyers, 4 waves of immortals. This time it's Swampuses (Swampi?) and they have more Mistresses as well as Trolls, Bile Daemons and Warlocks with them. I failed a couple of times and it wasn't even close. The Swampuses take too little damage from traps and rooms and the Mistresses let them surf past zappers and ice. I had to build a Corridor of Death to beat them. I also used Ghosts and Mistresses (Ghosts on speed) to get past the resistance of the last wave of Swampuses. purgatory_1 wrote: Domain of ether took me a while, finally finished it with 35 warlocks and a mist from the guild. Disable all the traps in the left corridor and the traps on the left of the dh and send them all in at once. 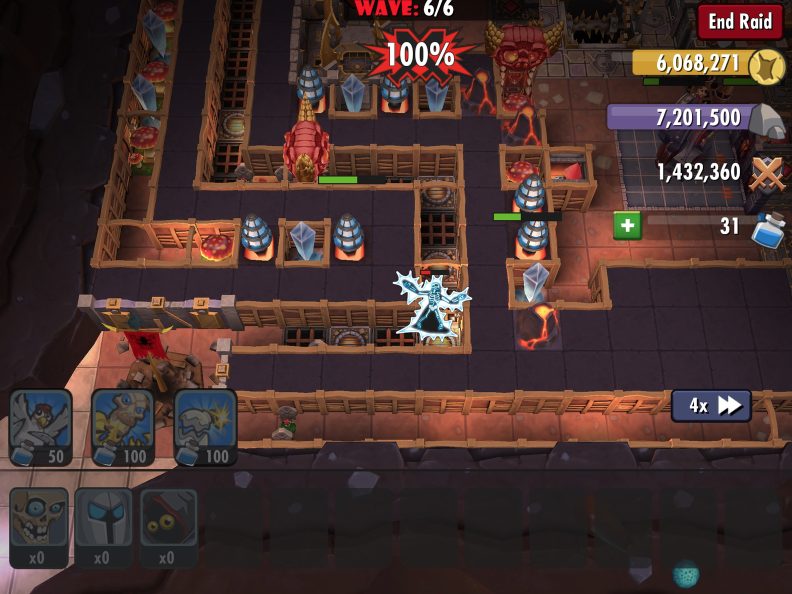 Use a couple of skellies to trigger the zappers if you don't have scouting. toulouse wrote: On the defense mission I trapped him on a LVL 10 fireburst with a couple of zappers, one volcano and a workshop shooting. It took _ages_ to kill him even on a 4x speed. Note: Place the vampire on a spike trap instead. This mission has 6 waves. The first is the now familiar flyer wave coming from four directions. You'll want to make sure they destroy the right rooms in the right order so you can control where the next waves go. The second wave is Boss Tiny with a bunch of smaller Tinies and Ghosts. Again, be careful what they destroy (if anything) because the remaining waves HAVE to go through your Corridor of Death as they will wreck any other defences. The third wave is Boss Horny and his little brothers. Nothing fancy. The fourth wave is Boss Glargll's team. Be careful with how you've prepared your dungeon because their Inkball attacks combined can destroy any room they happen to pass within 3 squares of. So don't let them close on their way to the Corridor of Death. The fifth wave is Boss Swampus and his friends. No trouble as long as they go into the corridor. The last wave is all the bosses again and the Boss Vampire last. Just be careful with Tiny as she might open up a room before the Vampire spawns and then it's all over. The rest of the bosses will die in the corridor but you can speed their demise with a few Ghosts and a Mistress. Last edited by Kaihawaii on Sat Nov 28, 2015 3:26 am, edited 21 times in total. Re: Howto (Walkthrough): Campaign "Battle of the Elements"
I did the first two yesterday and the third this morning. This is just 5 waves of mostly flyers. First wave spawns all over the place but the rest spawn in the last destroyed room as normal. It's harder than the weekly raids. I failed once and moved a couple of AAs, then passed. If you're having trouble just redesign your dungeon to deal with AI. Plenty of posts about that elsewhere. 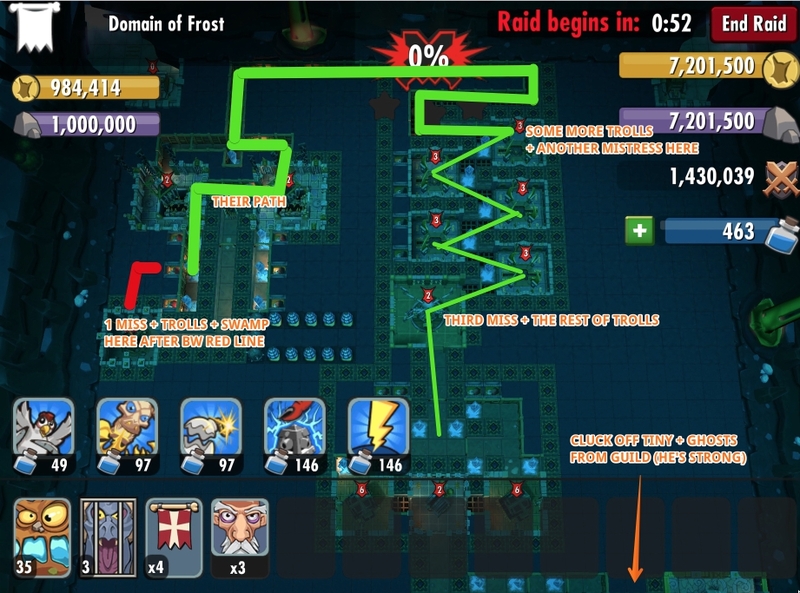 1xBomb Wall (maxed) to make a shortcut to the first DL and the one below it. 1 wave of flyers, then 4 waves of Hornies with some Trolls and Mistresses. Lots and lots of Hornes. It's tougher than a weekly raid. Set up a corridor of death if you need it but high DCR dungeons probably don't need to do this. I made no changes and just clucked a few times in the last wave. Setup: Horny, 2 Mistresses, 40 Trolls and Guild Mistress. Thank you for your opinion, we'll put all level together as announced. Many more real issues, why a player or playing style is "less worthy". A player sabotaging other's guilds would meet such criteria for sure and not worth a single reply. A Walkthrough for - not offense DCR developed - keepers is worth some shiny golden name blingbling. Half of the challenges are defense related.. So only high DCR will be able to pass them, so your walkthrough is not to help the weak but to get the easy way the highway.. Besides being told kills all the fun... Whatever just my opinion. Im not coming back to to this thread to argue more.